VCF Viewer is compatible with VCF contacts from email clients like Outlook, WLM, G-Suite, iCloud, Mac Address Book, iPhone, Windows Address Book, Palm OS, Mac Mail, Android, WhatsApp, Apple, Blackberry, Entourage, etc. With the help of vCard Opener tool, a user can easily open, view and read VCF file contacts without any hassle. The tool is smart enough to provide the view of all related attributes also. For example, name, address, email id, and much more. In addition, it provides view of all images also if incorporated in any contact. The another best part about the VCF File Reader software is that it supports vCard from any mail client. For example, iCloud, Outlook, Mac Address Book, iPhone, Mac Mail, Android, WhatsApp, Blackberry, Windows Mail, etc.VCF Viewer Tool is independent of all the email platforms and does not require native program installation to read VCF file. The VCF Viewer software is designed with such a high-tech algorithm that it supports two different types of VCF files. One is vCard with single contact and another is single vCard with multiple contacts. Thus, a user can easily view any type of VCF file without any hassle in just a few number of clicks. The vCard Viewer tool provides one unique feature also i.e., search contacts maintained within the VCF file. Moreover, if a user wants, then he or she can sort the VCF files based on the date, size, alphabetical order, etc. 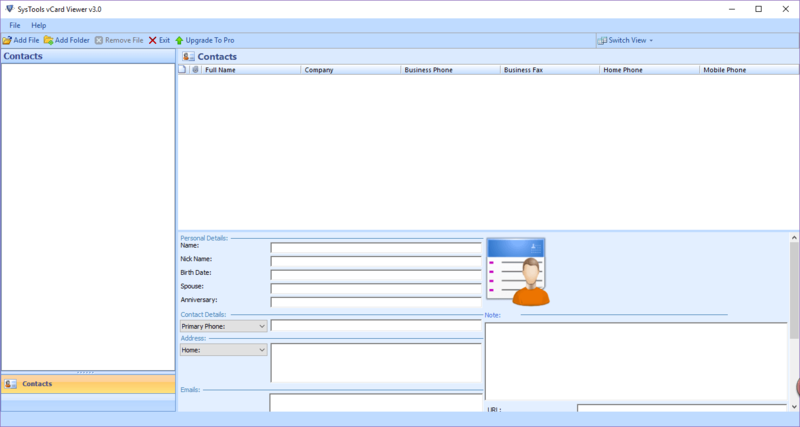 Using this feature, it becomes really easy for the users to manage all contacts very easily. In order to open and view vCard file, the VCF opener tool offers two different options to add vCard i.e., Add file & Add Folder. To load single vCard at a time, go for Add File option. In addition, to add a complete folder of multiple VCF files at once, go for Add Folder option. These two options make it easy for the users to open and view any number of VCF file at once. You can view a number of contacts details in a VCF file. There are such things like name and address of contact, image associated with the contact number, phone number, email address, company phone number, etc. VCF Viewer tool helps a lot in getting all the details related to your vCard contacts in an easy way. Free VCF Viewer Tool Supports to Only Preview Different Types of vCard Files Supported in Outlook, G Suite, iCloud & Skype etc. For Windows 10/8.1/8/7 or Vista users, launch the tool as "Run as Administrator". Compatible Platforms: Gmail, GSuite, iCloud, Skype, Android, IOS, Windows mobile, WhatsApp, etc. Explain the functioning of VCF Viewer Tool? Step 1: Install & run vCard Viewer Tool. Step 2: Click on Add File or Add Folder option to add a single VCF contact file or a folder consists of multiple vCard contacts. Step 3: Browse the file or folder from your system. 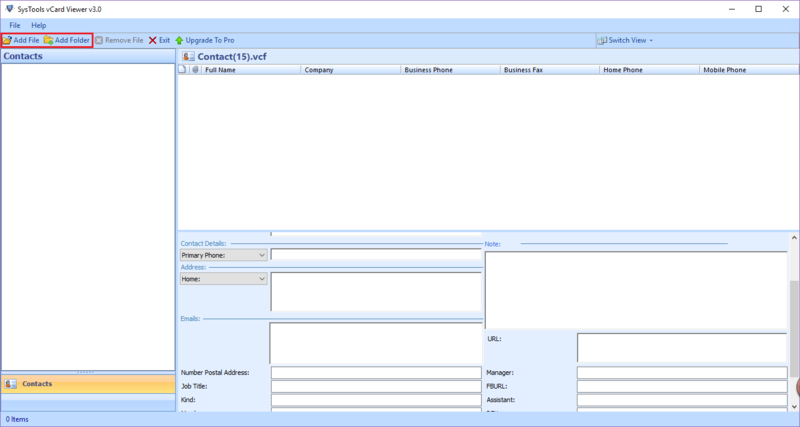 Step 4: The software will load all the contacts on the left side of the window. Step 5: Now, you can open each and every contact to view all the details in that contact on the right side of the window. 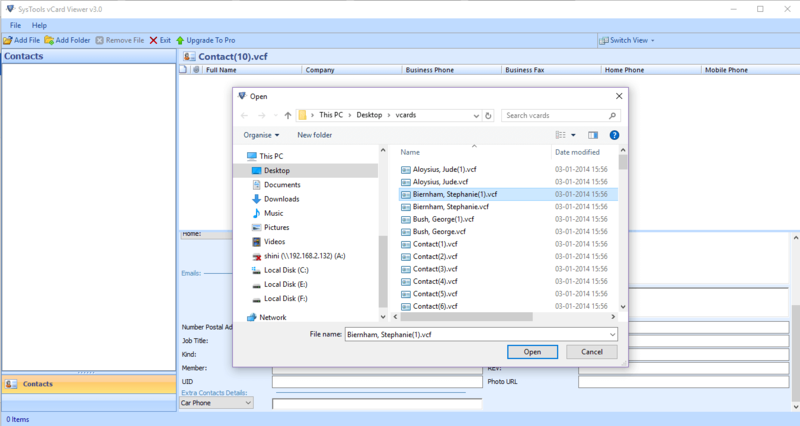 Can I open, view and read vCard contacts using VCF File reader software? Yes, with the help of this VCF Viewer software, a user can easily open, view, and read contacts from the VCF files without any hassle. Is it possible to change the order of contacts inside the vCard using this application? Yes, a user can easily view and sort the contacts inside the VCF files using vCard viewer tool. In addition, one can sort contacts in any desired order like by date, by size, in alphabetical order, etc. Can I use this VCF Viewer software on MS Windows 10 also? Yes, you can easily use this VCF opener utility on any version of Microsoft Windows, including Windows 10. Does the vCard file reader software impose any file size limitation for vCard? No, the VCF Viewer software does not impose any VCF file size limitation. Is it possible to view images also associated with particular contact? Yes, the VCF opener application has the ability to view VCF file along with incorporated images without any trouble. "The VCF Viewer is one of the best application that I have ever tried to open vCard file contacts. The user interface of the application is very simple and self-explanatory that any one can use this tool without any expert help. I always like the solutions offered by the Freeviewer, you develop the vCard file reader products by keeping the user requirement in mind. Hope to see some more exciting products by you in future. " "It is an amazing utility to view any number of contacts stored in VCF file without any file size limitation. 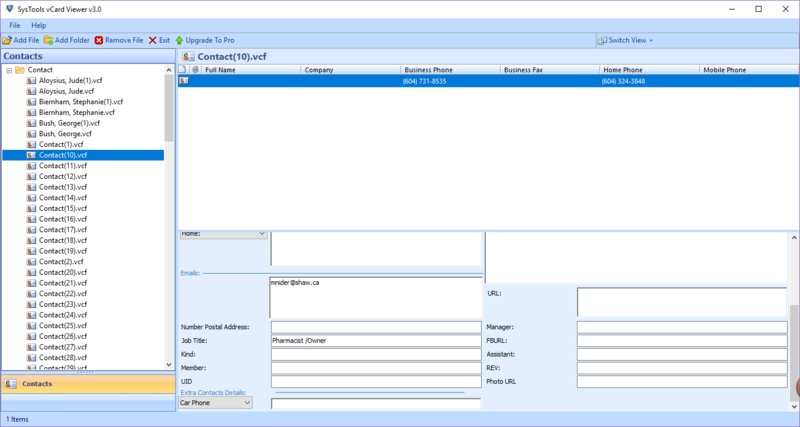 Moreover, the vCard Viewer tool offers sorting option to change the order of contacts stored in any desired manner. The best thing of the tool is view vCard file in any Windows OS 10, 8, 7, etc versions. I like this application so much that I am definitely going to suggest this VCF viewer application to my friends also." "I have a large number of contacts in VCF file format from my Outlook account. It was hard for me to view those contacts on my system without any email application. But with the help of vCard Viewer tool, I was able to view all those contacts in this software and for free of cost. I would recommend all to go for VCF Viewer tool!" "I have tried many tools but FreeViewer VCF Reader tool works for multiple platforms like G Suite, Android, iPhone, Gmail, Outlook, etc. It is quite good that it supports a lot of platforms at a time. Therefore, it provides flexibility to any user who are looking for a solution through which anyone can view the contacts easily with the help of this tool. Thanks for such an effective tool!"